Explore Philadelphia's Magic Gardens on South Street. Looking to escape the typical happy hour bar scene? 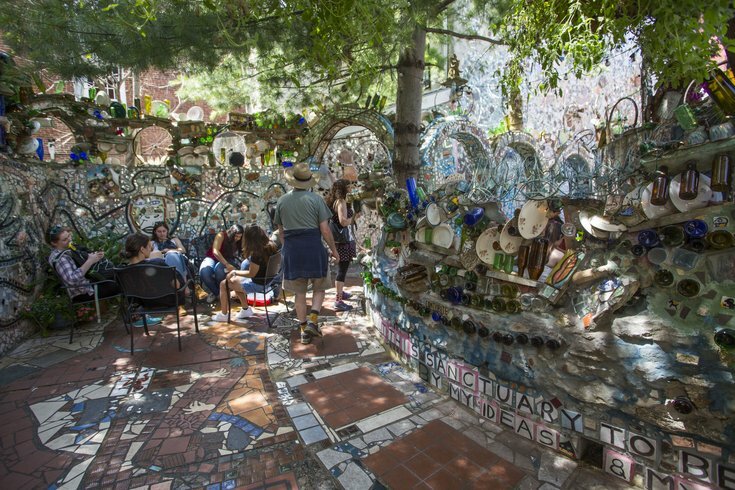 Beginning in May, Philadelphia's Magic Gardens welcomes the 21-plus crowd to get buzzed among Isaiah Zagar’s mosaics. Garden Sips will take place on the second Wednesday of the month through September, from 5 p.m. to 8 p.m.
Spanning half a block, the space glitters with thousands of mirrors, mixed among glass bottles, tiles and found objects. Garden Sips guests will be able to explore the mosaicked labyrinth while drinking Barefoot Wine and Pabst Blue Ribbon. There will also be nostalgic crafts like Shrinky Dinks and Perler Beads, as well as vinyl tunes from South Street’s BridgeSet Sound. Drinks are included with tickets, which are $20 (members receive a discount). Sales go towards Magic Garden's educational programs and a percentage of proceeds will be donated to ACLU Pennsylvania and Planned Parenthood Southeastern Pennsylvania. Tickets will become available two weeks prior to each event.